What is Pivasta (Pitavastatin) used for? Pivasta (Pitavastatin) is used to help control high cholesterol. It can reduce the bad cholesterol (low-density lipoprotein or LDL) and tricglycerides, while increasing high-density lipoprotein (HDL) cholesterol. Pivasta belongs to a class of medicines called statins. Cholesterol synthesis is largely dependant on an ezyme called HMG-CoA reductase. Statins, including Pitavastatin, help to control cholesterol by inhibiting the actions of this enzyme. How should I use Pivasta (Pitavastatin)? Pivasta is available in three differenct dosages and comes packaged as a strip of 10 tablets. Available dosages are 1mg, 2mg and 4mg. To treat high cholesterol in people without any other contravening factors, a starting dose of 2mg per day is often used. A maintenance dose between 1mg and 4mg is then prescribed after seeing how well the patient responds to treatment. It is not recommended to take more than 4mg per day. Pivasta tablets are to be swallowed whole. Do not crush or chew the tablets. Swallowed tablets with a glass of water. Pivasta can be taken with or without food. Pivasta may need to be taken even after cholesterol levels have been lowered. Take these tablets for as long as you are advised to do so by your doctor. What are the side effects of Pivasta (Pitavastatin)? 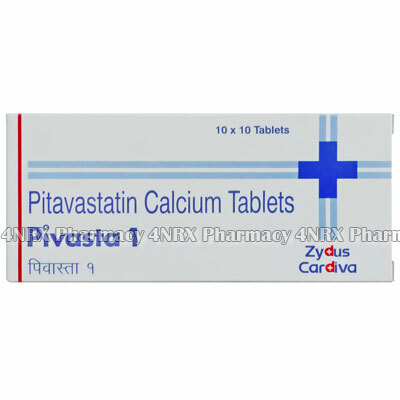 In few cases, Pitavastatin has been know to cause liver problems. This risk of liver damage is higher in patients with heavy alcohol consumption. Myopathy (muscular dysfunction) has been reported with Pitavastatin. Tell your doctor if you experience any unexplained muscle pain or tenderness. The most common side effects of Pitavastatin are back pain, constipation, and diarrhea.